Ever feel like you have so many burdens everyday that you don’t even know how you face the day? So many things you are juggling to keep control of? Feel like your life is out of balance and incapable of being fixed? Pushing to take the last step so that you can stand on what God has for your life? Knowing you are on the last lap of a particular race and you are in need of a second wind? All of these things indicate that we are in a place where we just need to give some things up. Our hands are too full of the things we think we have to take care of and we need to lay it down. During worship this past Sunday as we were singing His Grace is Enough, our associate pastor stood up and gave us a word picture about this very thing. He said picture yourself putting all of your “stuff” on a beach. For some it would only be a one or two things, for others the whole beach might be lined up, but no matter what just lay it down. Then as the waves come crashing upon shore, watch and see what God’s grace can do. God’s grace is the waves. Never stopping. Consuming the beach wave after wave. 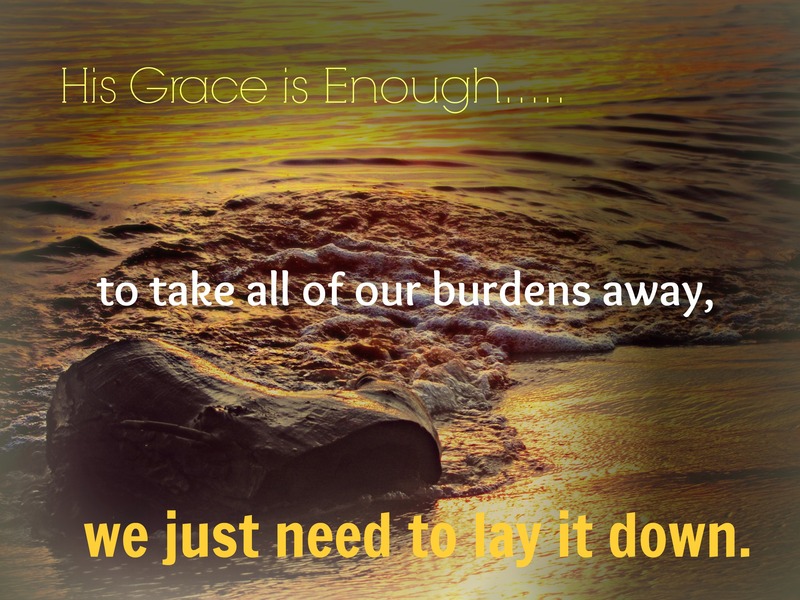 As we begin to lay down our burdens before God, He can supply us with the grace it takes to push through, run the last lap or to just stand on His promises. Sometimes we make our lives so dark and perhaps that’s because we can’t see through the pile we have collected for us to carry around. If only we could come to the realization that He never intended for us to carry our “stuff” around we could begin to see that God has a desire to set us free. He wants to take care of us. He loves us enough to shower us with His abundant grace. As I wait on God today, I have laid on my beach the books I want to get published. As I watch the waves wash over something I had been carrying around like I needed to do something about them I find peace again. I feel like God still has a plan and it will take His grace over my life to see it come to pass. I also realize that I can’t do it alone and I had to lay it down before I became overwhelmed with why things were not going fast enough or in the right direction. If we allow God to erode our burdens away, we then allow Him to pour into us. We let God be God in our lives. We come to the full realization that His grace is enough to get us through, day after day after day even when the face in the mirror is telling us otherwise. Good word as usual~ blessings.